Are you one of those ROUGH ‘N TOUGH guys who can handle your own? Or maybe you prefer to have someone else handle yours? Think you can take a couple shots across your face? 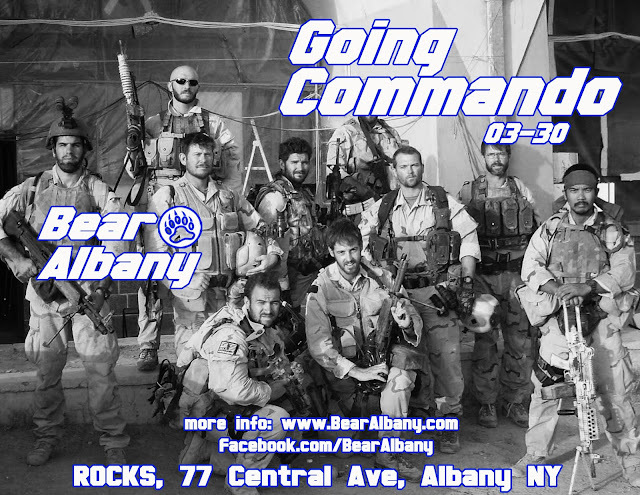 Cuz that's the kind of men we're celebrating for GOING COMMANDO weekend (March 29-31). We're inviting all you BEAR ALBANY BUDS to come show off your SWAGGER and come in your favorite fatigues, uniforms, leather, blue collar work gear, or whatever else turns you on. We're back at the Marriott Townplace Suites. Use Corporate Code "EBA" for Online Reservations or ask for the "Bear Albany Discount" by phone to get our special DISCOUNT rates (518-860-1500). As always, there's no event registration fees and the hotel has a FREE SHUTTLE so you don't have to drive to the bars!